Based near St. Ives, Cornwall, Harry farms more than 400 acres of grassland for his pedigree Guernsey herd, which consists of 160 milking cows, plus 140 followers and dry cows. “I entered the competition in December (2016) and I received an interesting call from the editor of Farmers Guardian in March telling me how I had won the competition, which I thought was fantastic news,” he says. Drawn out of more than 6,000 entrants, Mr Mann says he found out about the competition in Farmers Guardian and entered it online. 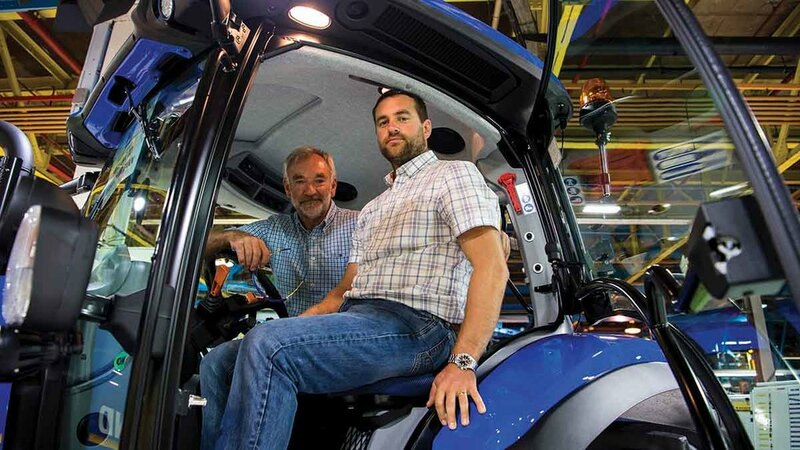 Mr Mann’s prize is the largest model in New Holland’s T6 range, the T6.180. While options such as AutoCommand continuously variable transmission, front linkage and pto were available, Mr Mann says he did not want to over-specify the tractor. Even in relatively basic specification, Mr Mann’s tractor has been fitted with 12 LED work lights, decent sized 600/65 R38 (rear) and 480/65 R28 (front) tyres, and 380kg rear wheel weights to better handle the New Holland branded 770TL Stohl front loader, supplied by Lynx Engineering with a Trima headstock. The T6.180 is the only model in the T6 range to feature a six-cylinder engine, with the 6.7-litre, FPT motor being coupled to the firm’s 16 by 16 speed Electro Command semi-power shift transmission. The engine provides 145hp which boosts to a maximum of 175hp during pto and transport work. 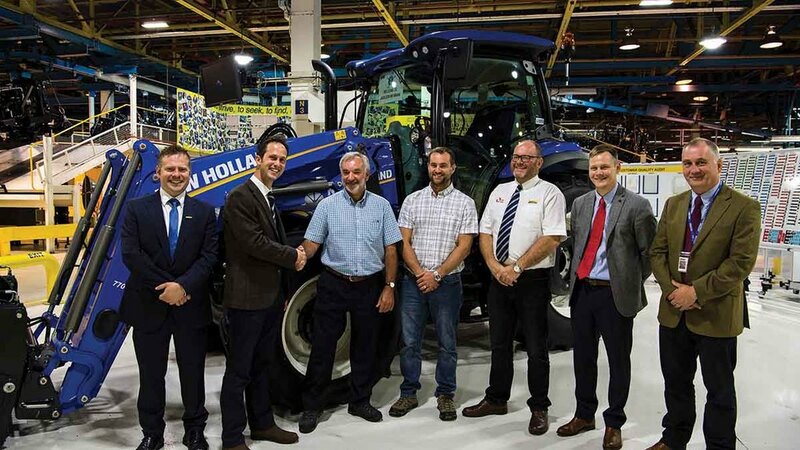 As well as being presented with the tractor, Mr Mann got the opportunity to see where it was made, with a trip to New Holland’s factory in Basildon, Essex. 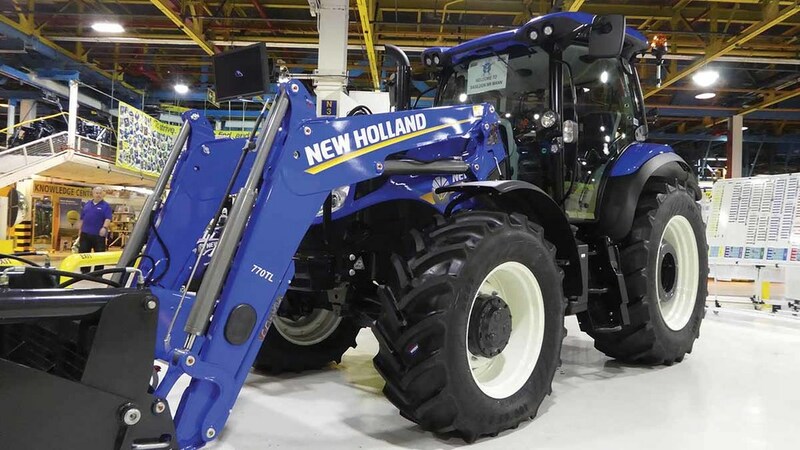 A presentation outlining New Holland and CNH’s history preceded a tour around the assembly plant, which explored the assembly from marrying up of engine and transmission, right through to painting, final assembly and testing. Waiting for Mr Mann at the end of the tour was his T6 prize. “I am very impressed with the factory. I have never been around one before so seeing it first-hand is brilliant. We pride ourselves on backing British, so seeing our machine at the end of its British build makes it even more impressive,” he says. The New Holland will join a mixed fleet of machines, ranging from a 2014 Case IH Maxxum 125, John Deere 6430 with loader, McCormick 115, and a number of older Internationals. Harry says the T6 will take over front-line duties from the Maxxum towing a 2,500 gallon Joskin slurry tanker and doing two silage cuts with a Pottinger Mex 6 trailed harvester.